I grew up in South Armagh during the Troubles. One of my earliest memories is seeing a neighbour get shot. Another is of narrowly avoiding a culvert bomb set by the IRA to attack the British Army. The brother of a classmate at primary school was murdered by the SAS. Ten years ago I discovered that a group of Loyalist paramilitaries had planned, in reprisal for an IRA atrocity, to attack the primary school that I attended to kill all the children and teachers. The plan was eventually vetoed: some things were just too much of a war crime for the war criminals of the North of Ireland. Little of this is ever far from my mind. But I have been reflecting on it of late, particularly with the UK careening towards Brexit with little plan other than, it seems, a visceral desire to keep foreigners out. This brings with it the threat of the reintroduction of a hard border on the island of Ireland. The Troubles were marked in one aspect by considerable division within the Nationalist community of the North. On one hand there were those who adhered to a non-violent approach inspired by Martin Luther King and coalescing around the Social Democratic and Labour Party (SDLP), the sister party of both British and Irish Labour. On the other hand there were those who found violence a justifiable response to the Partition of Ireland and hence were supportive of the IRA. What united both of these political strands, particularly in the border areas such as South Armagh, was a detestation of partition itself, which brought physical division to communities, military occupation and conflict. 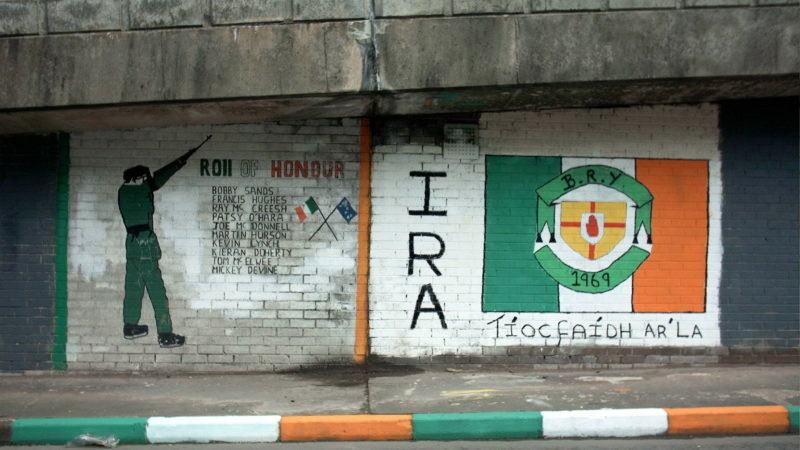 Future historians will argue over the role that the IRA’s fratricidal campaign, or Britain’s changing economic and geopolitical priorities played in getting everyone around the negotiating table. But the fact that there was a negotiating table to be got around was the result of lonely, patient political action under the most horrendous of circumstances by the SDLP, and steady diplomatic endeavour by successive Irish governments. What is blatantly obvious from the speeches and writings, in particular, of John Hume during this period, is that the foundations of those diplomatic and political efforts were European. It was the shared membership of the European Union that provided a new framework between the UK and Ireland that could allow for vital new perspectives on the relationships between the islands of Britain and Ireland, and the communities of these islands. And it was these new perspectives that ultimately brought about the ‘three-stranded’ process that led to the Good Friday Agreement. The peace that the Good Friday Agreement brought was not inevitable. It was the result of difficult choices and painful compromises to establish a constitutional framework that provided the possibility of difference being settled by argument and negotiation instead of violence. Most people in these islands, apart, it seems, from the supercilious Michael Gove, are grateful for the end to the bloodshed that brought. But Brexit now places the basis of that settlement in the balance with the very real risk that it could lead to a re-partitioning of Ireland with a hard, Brexit-imposed border. As someone who grew up with that reality, I am frightened to contemplate the sort of passions that would be unleashed were that to occur. With the date that Prime Minister May has set for triggering Article 50 fast approaching it is increasingly clear that the choice facing the UK is a simple one between ‘hard’ Brexit or no Brexit. This is something that the Leave Campaigns with their diverse lies were careful to obscure in the run up to that vote. Some of them deny it still, but they are either deluded or disingenuous. In spite of all of this, aside from an admirable report by the House of Lords on the Irish implications of Brexit, there seems little interest among UK politicians or media of the risks to Irish society posed by Brexit. Labour seems caught up in a laughably glib utopia of a ‘People’s Brexit’ every bit as ludicrous as the Tory visions. Both seem unrooted either in geopolitical or economic reality. Both present the ultimate prospect of a Little England politically and economically separated from our fellow Europeans, assured of being the junior party in any trade deals the UK finally manages to negotiate, unless, of course, it’s with New Zealand. Both bode ill for the economic and political well-being of Ireland. But, while the outcome of that referendum does not absolve elected representatives of their constitutional responsibilities to act in the best interest of their country, one might be able to ignore their lack of moral courage in upholding this responsibility if the only damage they could inflict were to their own country. Perhaps it would help focus the minds of UK parliamentarians if the Irish government were to make plain and public at this point that any Brexit that reintroduces a hard border in Ireland will lead to Ireland vetoing any future UK-EU trade deal. Aidan McQuade is the director of Anti-Slavery International. He writes in a personal capacity. Follow him on Twitter @the_mcquade. It certainly needs strong action by the Irish government, such as you propose, to bring to their senses the likes of Theresa Maybe and her supporters to realise the stupidity of any kind of Brexit. Yes really a good idea… for both sides. See http://www.britishirishchamber.com/value-of-goods-1996-2015/ for trade between both sides. If people cannot accept the democratic will of the British people and wish to turn to terrorism then so be it. The IRA fascists will lose. Strange how Sinn Fein and SNP want to hand power to the EU. The IRA were beaten 20 years ago, they’ll be beaten again.